If you are a dollar-for-hour company, tracking time is a necessary evil. Whether you flat bid or bill hourly, you need to know how your projects are progressing in real-time. Even if you don’t bill hourly, using Intervals time tracking software to know where your time is going is invaluable. Intervals marries online time tracking with task management to make tracking time more natural. This union also makes reporting a lot more powerful, as you can break down your workday by projects and tasks. Not a fan of timers? No problem. Intervals includes the ability to manually add time or import time to any project or task at your leisure. 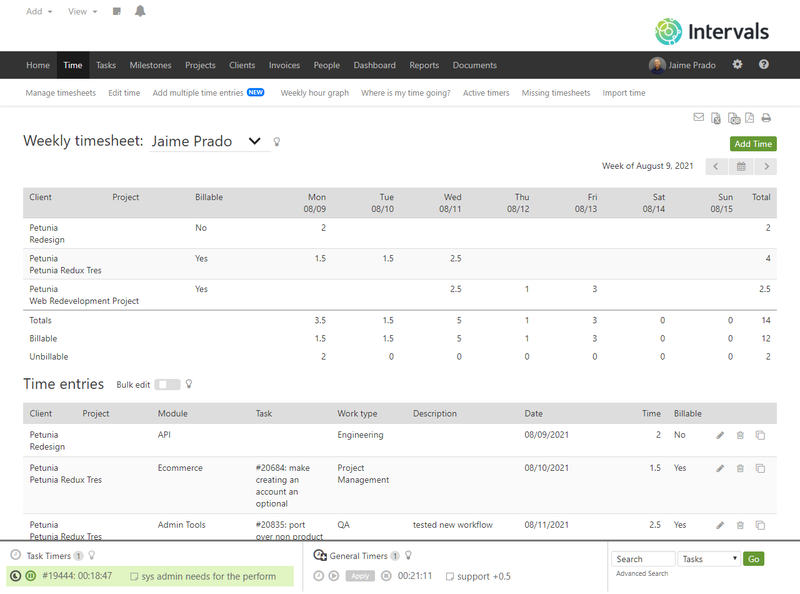 For those needing more structure, track time on every task or use general timers to track time at the project level. Time is money, it's important to know where it's going. Losing track of time can shrink your margins and put you out of business. Out of the office? Utilize the mobile version to track time while on the go. Intervals was built not only to track time, but to make meaningful sense out of where time is going. Understanding which projects are taking your time and how that time is being spent is crucial to any business. Your timer has been saved. Try again? Intervals time tracking features include timers for easier and more accurate time tracking. Simply start a timer and leave it running while you work. Then, apply the timer to your timesheet. Need to track time? Just start a timer. Try navigating around this site. When you come back to this page, your timer will be just as you left it. Though only one timer is displayed here, Intervals supports multiple task timers and multiple general timers.